My ring light actually blew a fuse... Super FML moment. Was very annoyed because I needed to take pictures and had already done my makeup! So anyway I went for Churp Churp's first community event! 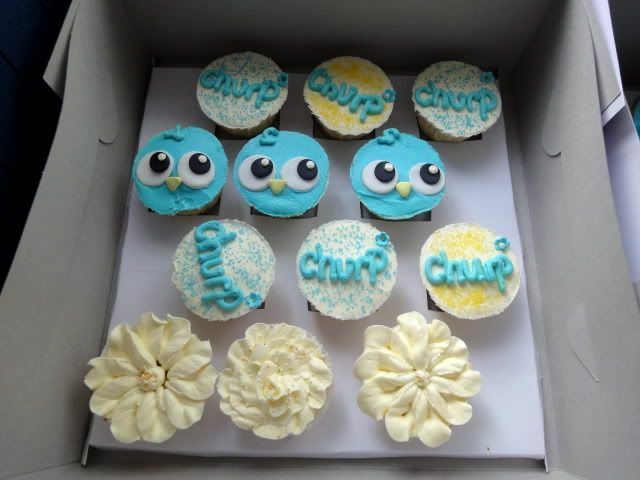 For those who may not know, Churp Churp is like the Twitter version of Nuffnang -> you can tweet/FB ads and be paid for it! All you have to do is connect your Twitter and/or Facebook account (only my Twitter is connected) and start sharing! Me on the right beside Brad (food blogger Ladyironchef)(yes it's a guy hahaha people always think it's a woman because of the name) being made to do some game! Random photo of Qiuting in front of my... pants. The theme that day was about magic tricks! He also played a lot of tricks on me... and I was the only one in the room who didn't know what was going on ): took me damn long to get it hahaha #uncool. With Qiuting and Brad! No idea why Qiuting is squatting since both Brad and I aren't exactly short haha. 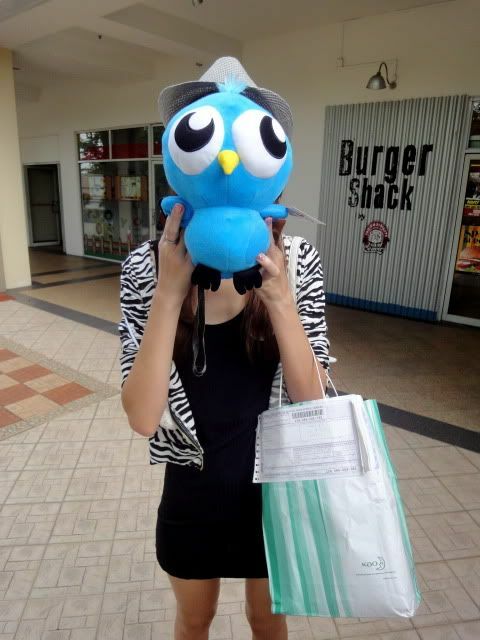 Hehe and with our Churpie plushies! Jessica and Sam baked yummy cupcakes for the event! I'm so sad that she lives in Simei/Changi... which is like... super far (you have to self-collect cakes/cupcakes). Went to eat with Brad and Qiuting after that! Despite having the famed Ladyironchef with us... we ate at Burger Shack hahaha. Which is ok but not like... food-review-worthy you know? (I'm talking as if I've actually eaten at Burger Shack before, which umm... in fact I haven't hahaha). I didn't eat because I already had lunch. So we all took the same photo of Qiuting with the respective cameras and... Ok fine the disparity is quite large. 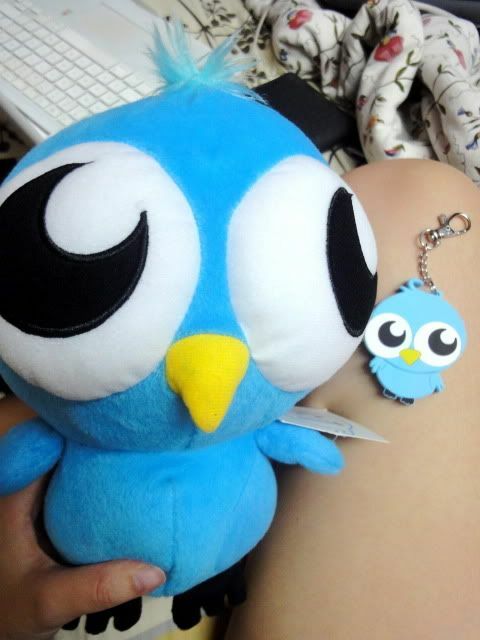 My Churpie plushie and... Churpie thumbdrive-keychain! Hehe you pluck off Churpie's body to reveal the USB thingy, so you'll have Churpie's head sticking out the side of your laptop! I'm trying to find some reason to use it but sadly I have no files or people to transfer things to )': Why is life so hard? Those cupcakes look really delicious! Awww the pendrive looks cute. really unique. i Hi. sorry to ask but this is just a question on my mind. do u remove your VGG hair, as in hair down under? but i heard shaving is pretty unhygenic as in may get cuts!!! so if u remove, how do u do it? Anonymous: I've tried both; it really depends on how much you want to remove. Shaving is fine if it's just for "trimming/maintaining" purposes, no issues with cuts or whatever. If you want hair REMOVAL, then definitely waxing. I've tried DIY waxing strips and it wasn't that effective, so if you wanna wax just go to a salon/parlour (?) that does it.